July has been full of birds. 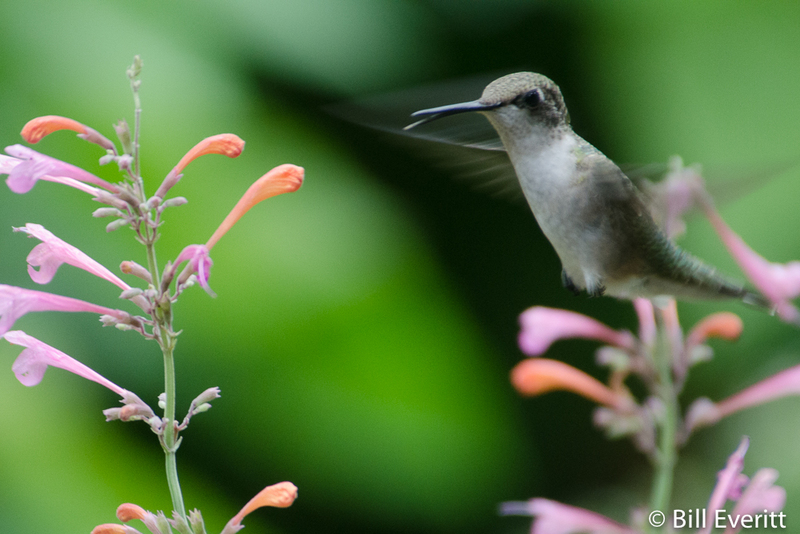 We think our yard has never been as full of birds as this past month. A cake of suet lasts about a day and a half and we’re filling large feeders every 4 days. Catbirds are everywhere, and we are getting up at sunrise to beat them and the robins to our ripening figs. Birds are still fledging, and some bird houses up and down the street and on the Nature Trail are hosting their third brood of this season. Two of the photos below, shot through our window, are of a baby catbird who wasn’t quite quite ready to fly and wound up in boxwood for a few hours. His parents continued to feed him and eventually he got his wings and left. What’s missing are butterflies and dragonflies. They were everywhere this time last year and this year we are seeing very few. Maybe the birds are eating the larvae. We are hoping that mosquito spraying is not involved in their disappearance. The last photo is of the newly resurfaced Nature Trail. If you are in the neighborhood, you should go see it. This entry was posted in Fledging, Juvenile Birds, Monthly Journal, Nature Trail, Spiders and tagged Agastache, American Goldfinch, Cicada, Cooper's Hawk, Eastern Bluebird, Gray Catbird, House Finch, July, Mourning Dove, Northern Cardinal, Ruby-throated Hummingbird, Song Sparrow, Zipper Spider on July 31, 2016 by beveritt. You thought nesting season was over for this year. And, except for goldfinches, you’re right. The American goldfinch begins its breeding season later in the year than any other finch and later than any other native North American bird except, occasionally, the sedge wren. Their breeding season is tied to the peak of their food supply, beginning in late July, which is relatively late. The pictures of the two Goldfinches eating Agastache seed on our back deck were taken on July 17, 2015. The male is the brighter colored of the two. Notice that the beak of the female is pinkish, indicating that she’s breeding. You can see a short video we took in July 2013 of two Goldfinches eating from the same Agastache plants. 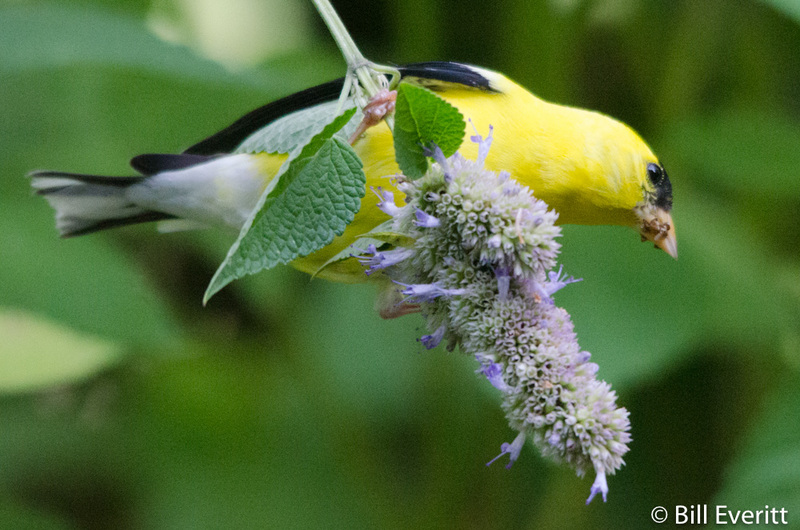 The American Goldfinch is a granivore and adapted for the consumption of seedheads. Its diet consists of the seeds from a wide variety of plants, including weeds, grasses and trees, such as thistle, dandelion, ragweed, goatsbeard, sunflower, and alder. 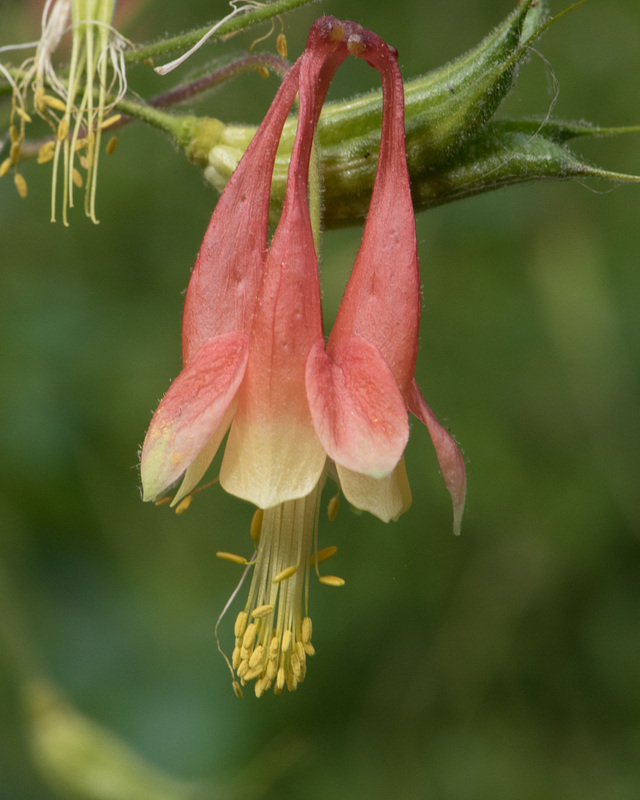 It also consumes tree buds, maple sap, and berries. Goldfinches will eat at bird feeders, particularly in the winter months, preferring Nyjger seed (nyjer is different from thistle: it comes from Africa and will not sprout). In our yard, they especially love the bird feeders as well as the dried seedheads of Agastache, Coneflowers and Black-eyed Susans. Their nest is built in late summer by the female in the branches of a deciduous shrub or tree at a height of up to 30 feet. The inside diameter of the finished nest is about 2 1/2 inches. The rim is reinforced with bark bound by spiderwebs and caterpillar silk, and the cup is lined with plant down from milkweed, thistle, or cattail. The nest is so tightly woven that it can hold water, and it’s possible for nestlings to drown following a rainstorm if the parents don’t cover the nest. The chicks hatch 12–14 days after incubation begins. The hatchlings develop quickly, opening their eyes after three days, and completing the growth of olive-brown juvenile plumage after 11–15 days, at which time they begin to practice short flights close to the nest. 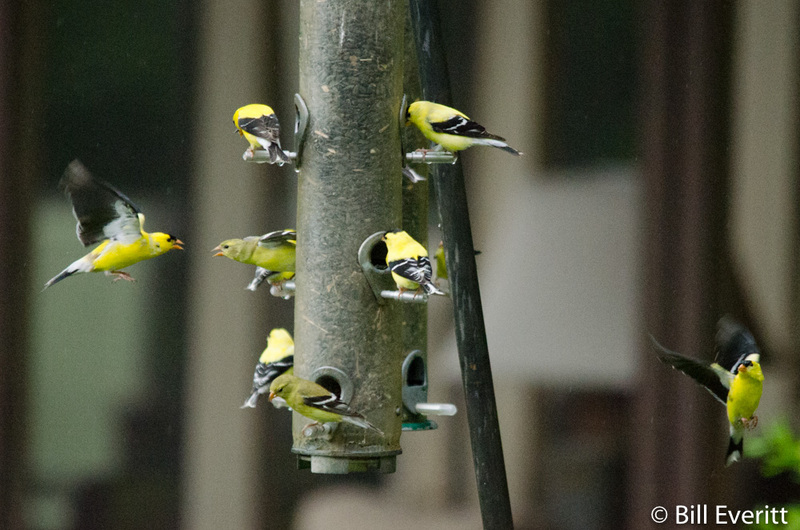 Then, they join their parents at bird feeders, which is why you’ll notice a spike in the number of Goldfinches in August. 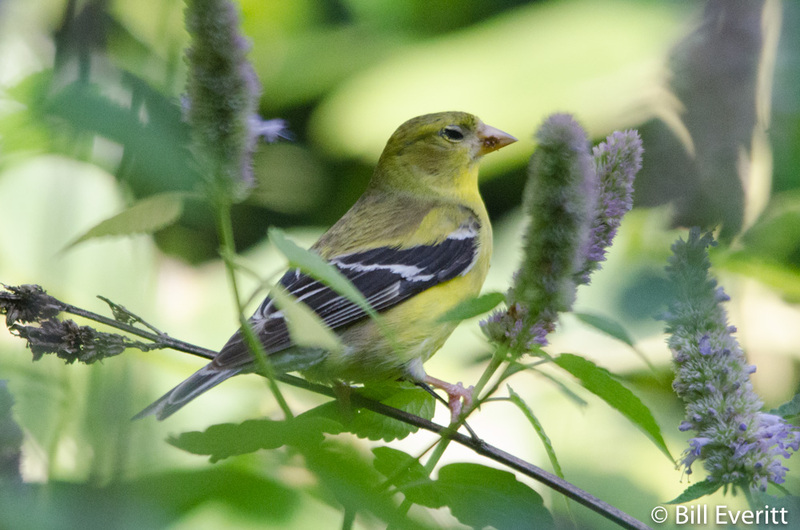 This entry was posted in Bird Feeders, Bird Nesting and tagged Agastache, American Goldfinch on July 17, 2015 by beveritt.